As far as the modified bedrest is going, I keep pretending like I've been healed or something - but then I realize that I'm really just living a half existence. I still get to do most stuff with the kids, but I haven't been anywhere alone with them in a while and a trip up the stairs carrying even Glory puts me out for a good while. This morning I even prevented us from a trip to church because I let my iron get too low and passed out a little bit. Boo. It's just hitting me how really different this pregnancy is & how truly modified I'm living. That being said, a favorite afternoon activity of mine has become spending Elias' rest time with him while Glory naps. He is a complete and total cuddle bug and one of our favorite rest movies is Wall-E. Don't worry, Shrek, Cars, & 'trains' still holds a special place in his heart - but Wall-E is making a fast gain on all of them. I love watching it because in all sincerity, I can sort of just doze off while he snuggles up to me - there is very little dialogue and not many loud zooming noises, even some nice melodic background music. About five minutes into Wall-E, I usually thank God that I am a stay at home mom and get to take a cuddle break each afternoon. Then if Nick is anywhere near or I can reach a cell phone, I try to thank him for giving me this opportunity. I don't want to take that for granted. Anyhow, something about the edge of sleep or the repetition of our daily routine has made me extremely philosophical about Wall-E. So, this post is for any of you that have the same questions I do. If you have answers, please respond promptly - hopefully before rest time this afternoon. a) How is my little a.d.d. toddler interested in this wordless film? I'd say 80% of the film's communication is nonverbal. Maybe this is the biggest reason his vocab is a little stunted - he's a nonverbal communicating genius. b) How did the "go-green" effort of this decade go so far awry? I mean, I haven't changed all my light bulbs to the swirly ones just yet - but I have a hard time believing that in just a mere 100 years we'd be living in feet and feet of trash? c) What happened to Etsy? The premise of Wall-E is that BNL (buy-in-large), a Walmart-type company, takes over the USA & convinces us to go live in space while they clean up the mess we've made. I really thought Etsy was going to slowly put Walmart to shame, if not out of business. Hmph. 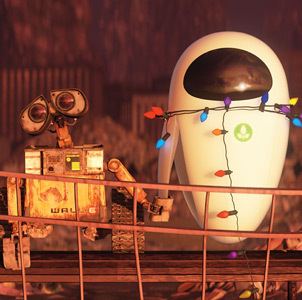 d) Why is the wall-e we know & love the only one who survived? Is it because of his personality adaptation and ability to love? Did the other ones not have this emotion and therefore did they lack the tenacity it took to survive their endless days of clean-up? d2) Is our Eve the only Eve who has the ability to love to? And is that why she likes to dance so much? e) What are those crazy windstorms? Are they related to the trash issue? f) Why do the people on the Axiom live longer? Check on the dates that the captains serve as captains. Like over a hundred years each. Interessant. g) How do they make babies on the Axiom? If they don't talk to one another, do they still mate? Why did mamas stop being mamas and daddys stop being daddys? If robots are raising those fatty little babies, wouldn't they be a society of sociopaths? h) How do they live so long if they're so fat? Are we to believe they AREN'T getting diabetes, heart disease, & heart attacks from those crazy slurpees & cupcakes-in-a-cup? i) How are they going to live on earth amidst the psycho wind storms? j) When they do go back to earth and start planting their pizza seeds and getting skinny again, do we think that is what the new heaven & new earth will look like when Jesus comes back? Good question, husband, good question. ok. that's all for now. thanks for any answers you can provide.